Beresford is a premier oceanfront luxury condo community in Boca Raton, FL. This boutique condominium building consists of 53 units, with just four units per floor, offering residents the ultimate peace and privacy in beachfront living. Overlooking the sparkling oceanfront, Lake Boca Raton, and the Intracoastal Waterway, Beresford features some of the most spectacular views available in the area. Condos for sale in Beresford have two to three bedrooms and offer spacious floor plans with over 2,000 square feet of opulent living space. See below for all condominiums currently for sale in the Beresford. Though the most remarkable feature at Beresford is arguably the stunning water views, other incredible upscale features include tile floors, plush bedroom carpeting, grand foyer entrances, and chef-inspired kitchens with state-of-the-art appliances, granite countertops, and custom cabinetry. Condos at Beresford also boast oversized bedrooms with walk-in custom closets, wrap around terraces, and open layouts perfect for entertaining. Originally constructed in 1976, Beresford has undergone extensive renovations that included complete concrete restoration of the entire building, luxurious new marble tiled lobby, installation of hurricane impact glass throughout the entire building including the glass-railed balconies. 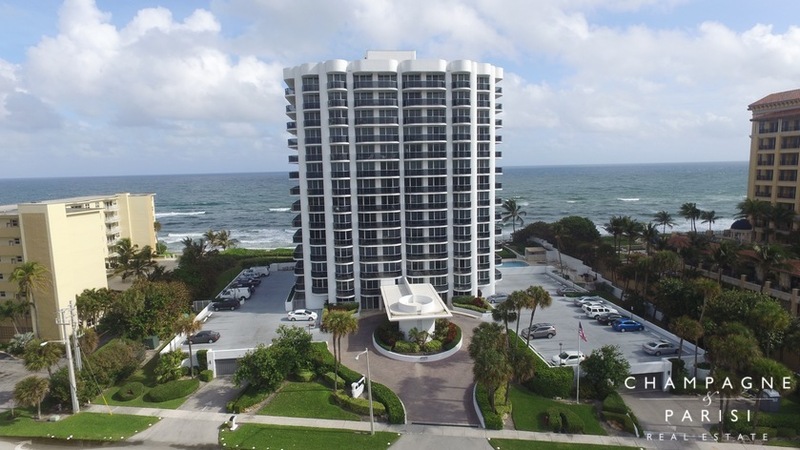 Beresford is located directly on the oceanfront off of A1A, just south of Palmetto Park Road in Boca Raton, FL. This prime beachfront location allows residents to enjoy the beautiful Boca beaches just steps away from the front door. Nearby are several beautiful community parks, as well as some of the area's finest shopping, dining, and entertainment options, including Mizner Park, one of Boca's most popular destinations. Residents of Beresford also enjoy the convenience of being just a short drive from the area's major highways such as I-95 and Florida's Turnpike, making it easy to make a quick trip to one of the nearby South Florida cities such as Ft. Lauderdale and West Palm Beach. Beresford is also close to some of the top-rated schools in South Florida, including Florida Atlantic University and Palm Beach State College. If you are looking for a relaxing and serene, yet luxurious Florida lifestyle, Beresford is the perfect beachfront condominium to call home. If you are interested in purchasing a condo for sale in Beresford in Boca Raton, you may also want to visit similar boutique oceanfront condominiums such as Luxuria, Excelsior, and Placide. If you would like to learn more about Beresford condominiums or any of the surrounding waterfront condominiums in Boca Raton, please contact us at 561-998-9015. You may also reach us by using our simple online contact form provided below. We at Champagne & Parisi Real Estate look forward to assisting you in finding your next dream home! Also, please consider registering for a free account which will enable you to receive automatic email notifications when new condos in Beresford come on the market in Boca Raton, FL.